The Square and the Old Town Hall. A. E. Houseman in his poem 'A Shropshire Lad' described Clun as one of 'the quietest places under the sun'. He didn't have todays traffic to contend with as it tries to squeeze through Clun's little streets. In spite of that it is quiet and peaceful; a delightful place to walk round. 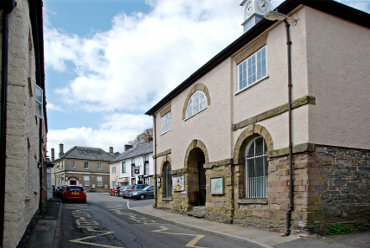 The Town Hall was built in 1780 as a market hall and is now the town's museum. You may think of Clun as a village but it was granted a town charter in the 14th century. 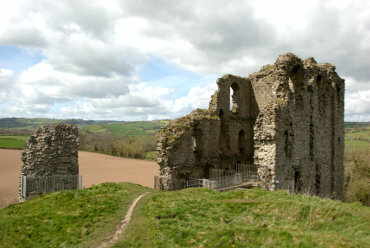 View of Clun Castle ruins. There isn't a lot of Clun Castle left but there is enough to warrant a climb up the castle mound to have a look. Built in the late 11th century it sits on a high mound overlooking the River Clun and the town. It is currently managed by English Heritage but there is no charge for entry and it is open at any reasonable time. 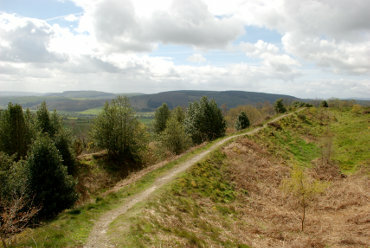 The Bury Ditches Hill Fort. 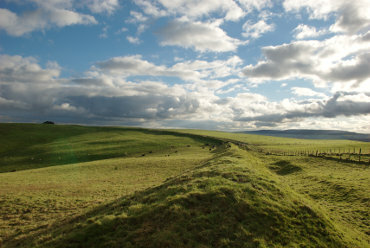 About two miles north-east of Clun is the Iron Age hill fort of Bury Ditches and can be reached by road via the village of Clunton. There is a free car park below the fort and an easy, albeit uphill, walk to the fort. This view shows one of the banks and ditches. Storms in the 1970s and 1980s led to the removal of woodland from the hill fort site on the crown of the hill leaving the fort open to view. Abount three miles west of Clun is Llanfair Hill with a height of a little over 1400 feet and running across the western flank of the hill is a section of Offa's Dyke. This section of the dyke shows an impressive profile of the bank and ditch over a distance of approximately 3 miles.